This post contains a comprehensive list of the new features and changes that are part of the recently released WordPress 3.1. 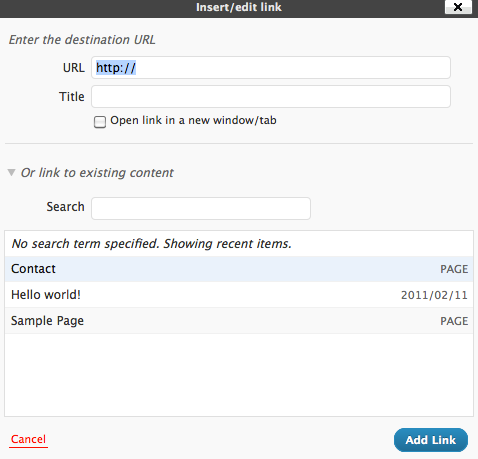 It is now much easier to link to an existing post or page from the WYSIWYG editor. Instead of manually having to type or copy/paste the URL, there is a new link to existing content section on the insert/edit link screen (see screenshot). Note that if you change a post or page URL after linking, you’ll still have to manually update the links to the new URL. There are ongoing discussions about improving this by using some kind of post/page link shortcode (which automatically uses the most recent URL to prevent 404 errors), so perhaps that feature will appear in WordPress 3.2. If you’re using WordPress’ multisite feature, it also provides an easy way to switch between sites that you’re a member of. Also if you’re using the WordPress.com stats plugin, a small graph that indicates how many visits the current page has received. The admin bar is enabled by default for all users, but can be turned off on a per-user basis using a new profile option. … meta information that can be used by themes to customize presentation of a post. When writing a post you will see a new “Format” metabox, and if your theme supports it your post will be displayed differently depending on the post format you selected. For example, with the Duster theme (the one that this site uses), the link and aside formats automatically appear in the Ephemera section on my home page. For more information on Post Formats, take a look at the Post Formats article in the WordPress Codex. The pagination feature is also improved. In WordPress 3.0, the Multisite dashboard was accessible via Dashboard -> Super Admin. Some users found this confusing, so as of WordPress 3.1 there is a completely separate dashboard for Multisite/Network administration. To access it, click on the Network Admin link at the top right of your WordPress dashboard. The Multisite specific dashboard features (such as the network settings screen, new site screen, new user screen, theme editor screen, and network wide plugin activation) have all been moved from the normal WordPress dashboard into the network admin dashboard. The network admin dashboard is also only accessible via the main website in the network (typically blog id 1). This is a big improvement over the previous site editor screen, which was a ver large page full of hundreds of editable text fields. For more information on The Network Admin, take a look at the Network Admin article in the WordPress Codex. In the last 6 months or so there has been a fair bit of debate on the exact licensing terms that WordPress is released under, and whether or not it complies 100% with the GPL license. WordPress 3.1 is now available under the GPL version 2 or (at your option) any later version. If you’re interested, there is a lot of information on the licensing debate on hakre’s blog. The WordPress exporter now allows you to export just post or pages (instead of everything), as well as only exporting certain date ranges, categories, authors, statuses, and more. It also contains proper support for navigation menus. The post and page editor now display fewer options (metaboxes) by default. This helps new WordPress users from being overwhelmed by the number of options displayed when they are writing a post or page. To customise which options (metaboxes) are displayed, browse to the post (or page) editor and use the Screen Options button on the top right of your dashboard. In my experience, very few WordPress users actually know about the Screen Options button, so I hope it is made more prominent in WordPress 3.2. Currently in WordPress 3.0 (and earlier), if you moderate and approve a comment on one of your own posts, you still receive an email notification saying the comment has been approved. To me this has always felt counter-intuitive. After all, I was the one that approved a comment on my own blog post, so it doesn’t make sense for me to be notified via email about the comment approval. In WordPress 3.1, this has been fixed. An author shouldn’t be notified when they post or moderate a comment. 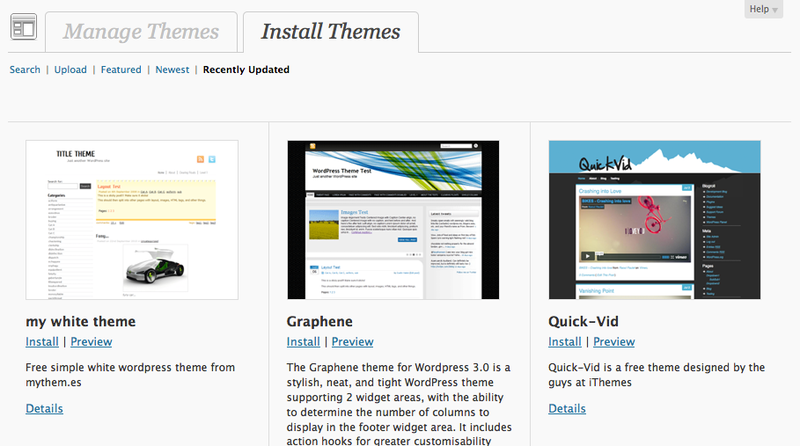 The theme browser/installer used to be accessible via Dashboard -> Appearance -> Add New Themes. 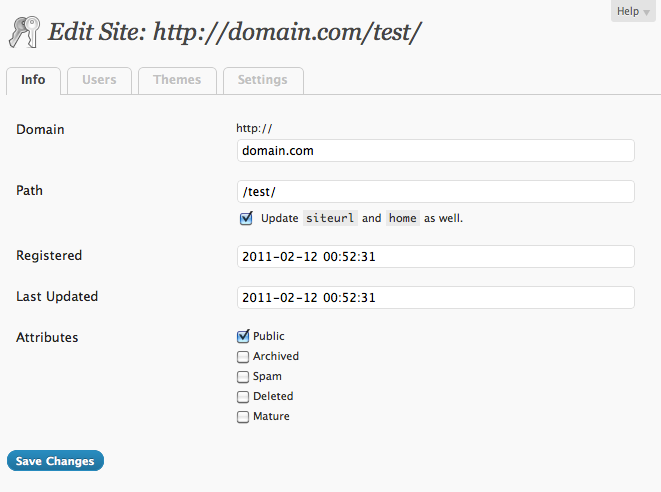 As of WordPress 3.1, it is a tab on the Dashboard -> Appearance -> Themes screen. Its user interface has been improved, particularly for sites that have a lot of themes installed. These changes were mostly inspired by the WordPress.com theme browser/installer. The core developers have also admitted that it took too long, and they plan on making the 3.2 release cycle much shorter. So what are you waiting for? Download WordPress 3.1 today! I love the new admin bar I am always using it and so simple. When it first came up I thought that my site was broke. Thanks for the post. The admin bar does make life easier, however there’s definitely room for improvement I think. For example, there is no link top level link directly to the Dashboard (/wp-admin/).